Argh! I know... I know... How typical it is to start a blog with a How To Make A Cheesecake post. But trust me, cheesecake was a lot harder to make in my mind...all the water bath....precise temperature control... I even thought I needed to "make" the cheese in cheesecake! But really, you do not need to worry all the things above to make a perfect cheesecake. I can't say that my cheesecake tastes the best in the world but honestly, I was quite shocked (and proud of myself) when I saw the final outcome. My cheesecake looks and tastes amazing! I did not go to any cooking school in Paris. So I am in no position to teach anyone. I am as fresh as a tomato when it comes to baking. But I do enjoy it a lot and hope I can have somewhere to jot down my juvenile cooking journey for me to look back on. First, preheat your oven to 325F / 162C. 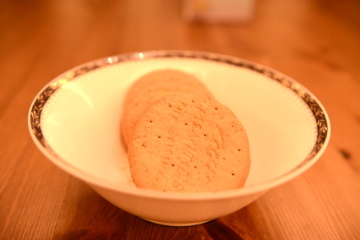 You will need 9-10 pieces of digestive biscuits. You may also use graham cracker, marie or even oreo. Melt the butter by sitting it on a bowl of hot water. ...until they turn into nice crumbs. Of course this little fluff got to have some... come on... who exactly can resist this face!? Add 1-3 tbsp of white granulated sugar to your liking. I added 1tbsp only. ...until the crumbs become wet sand like. Use a knife to trace the outline of your cake pan onto the parchment paper and then cut around it. Stick the parchment paper onto your cake pan by dabbing a few drops of oil or butter onto the bottom of the pan. Smooth out the crumbs mixture and press it firmly onto the pan bottom. Bake for 8 minutes, remove it from oven and raise oven temperature to 450F / 232C. You will need a gigantic chunk of cream cheese. My sister claims this the best cream cheese brand for cheesecake, and I claim it the best substitue for stone to throw at people you hate ;) You will also need 3 large eggs, some vanilla extract and sugar. Love this suff! One quick question: where can I get a big bottle of it? Start mixing on low speed. I used a hand-mixer this time. Mix it until the cream cheese becomes soft, creamy and fluffy. Add eggs, one at a time, mixing well after each addition on medium speed. Blend in vanilla. Your crust should be cooled and ready by now. Pour your filling into the crust. Bake for 10 mins at 450F / 230C and reduce heat to 350F / 180C for 25-35 mins. You know it is done until you see a golden layer or simply insert a toothpick into the cake and it comes out clean. Lastly, chill in the fridge for at least 3-4 hours, or overnight.